Our first project is from ‘Desire to Inspire‘… and that’s exactly what they do, inspire! 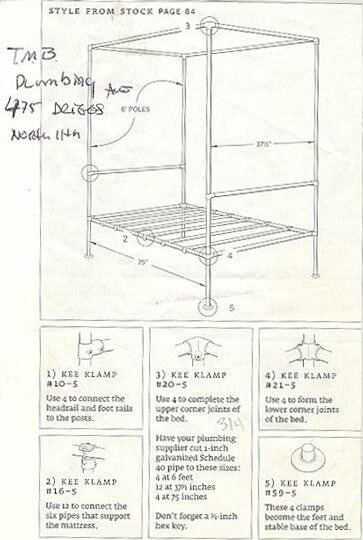 Love this DIY canopy bed made from industrial pipe, from ‘Apartment Therapy‘… They built this bed from an old issue of ‘Country Home’ and even scanned the instruction page for you. I like how this could look very ‘Restoration Hardware’ with the right bedding to soften and romanticize the pipe… Can you picture this with some floaty fabric wrapped around it as a canopy? 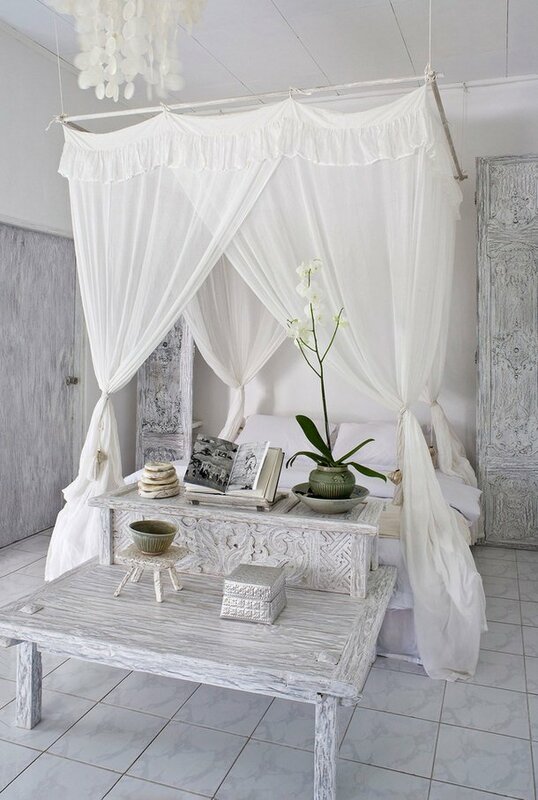 Try as we might, we could not find a source for this romantic, ethereal canopy bed! But we couldn’t leave it out, it’s amazing! You can see how the canopy is made from dowels hung from cord. Simple curtain panels are tied onto the canopy frame. I think the trick to a look like this is in choosing a romantic, flowy fabric. Jen from ‘Decor Sanity‘ is a new blogger, but wow, does she impress! 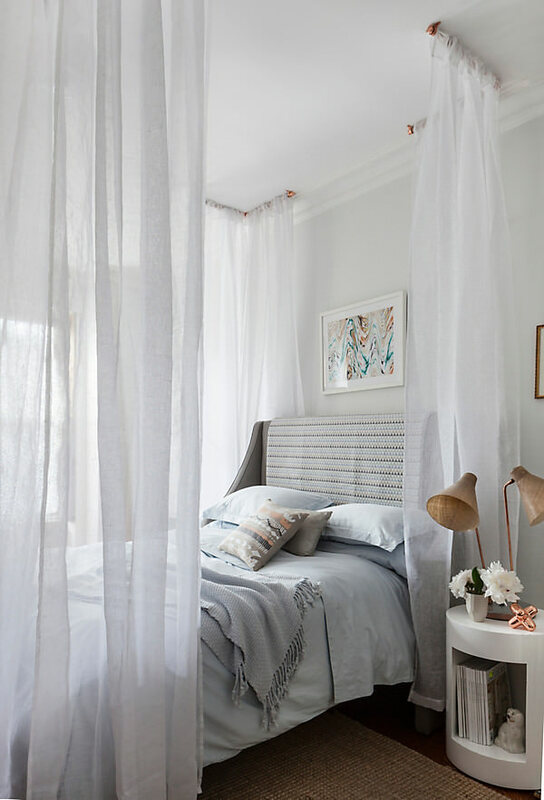 She made this DIY canopy bed herself from plans from Ana White (whom we love!). This bed will last forever, and it is gorgeous enough to be passed down as a family heirloom… How cool to be able to make a piece of furniture that your great, great granddaughter might get to love! ‘Domino Magazine‘ created this faux canopy bed with curtain rods and fabric. This is great for a more traditional room. Traditional does not mean boring… just choose an updated print to keep the room from looking “sleepy” (Couldn’t resist!) Photo by Simon Upton. 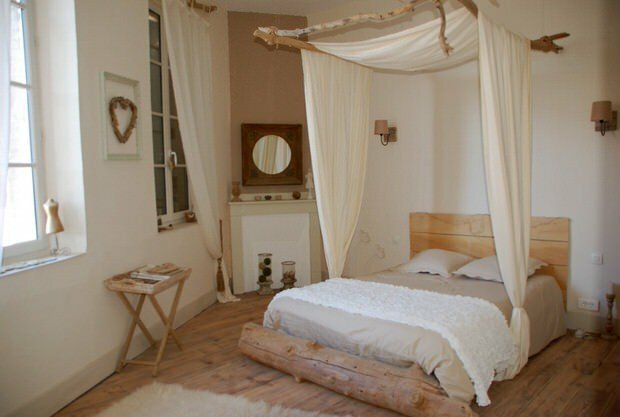 More inspiration from French site ‘Casa Naute‘… This frame was made using natural branches instead of dowels. Love! 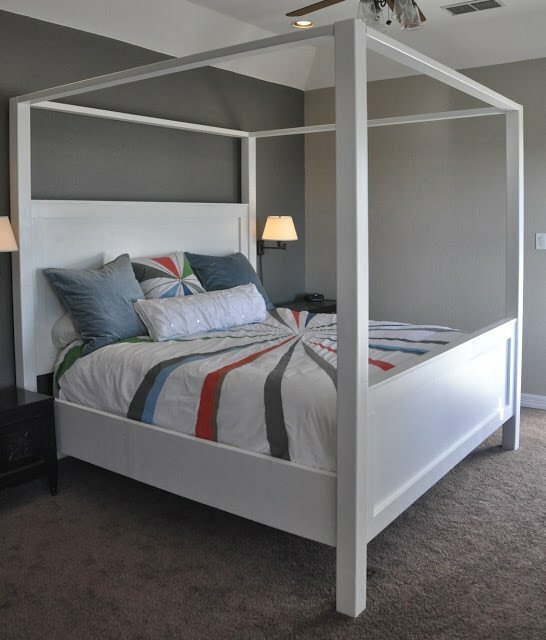 This is a simple afternoon project… This DIY canopy bed tutorial from ‘One Kings Lane‘ is made with items from the hardware store. 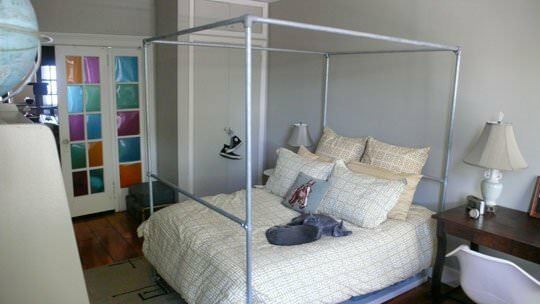 I love how this can be made for any size bed as well, and doesn’t close in the bed, but gives it the real canopy feel! Need some more inspiration? Go to the high end hotels! 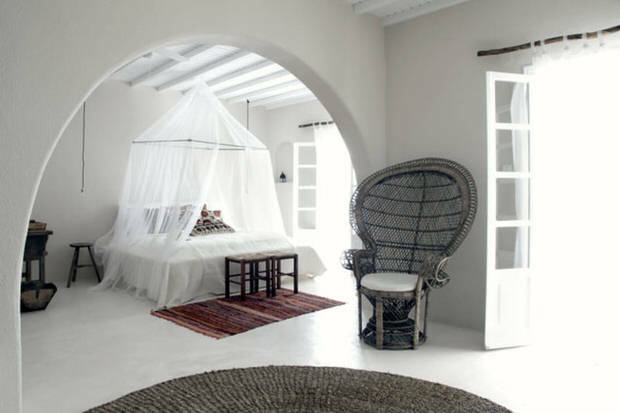 This guest room at ‘San Giorgio‘ will make anyone want to run out and make a canopy bed! 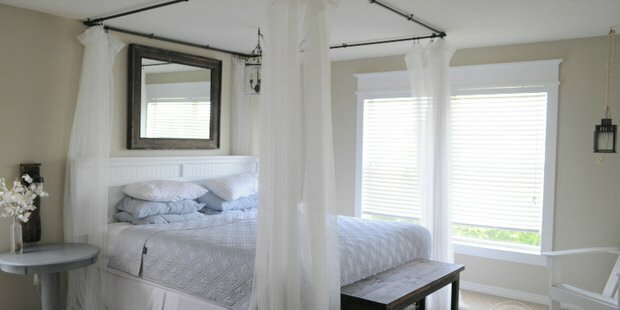 Looks like a hanging square frame (easily diy’able) covered with nice quality mosquito netting. Finally, Corey at ‘Sawdust 2 Stitches‘ has this tutorial for her DIY PVC canopy bed we wanted to make sure you had… We love this project so much, it was also included in our Romantic Projects post over at ‘TBD’! 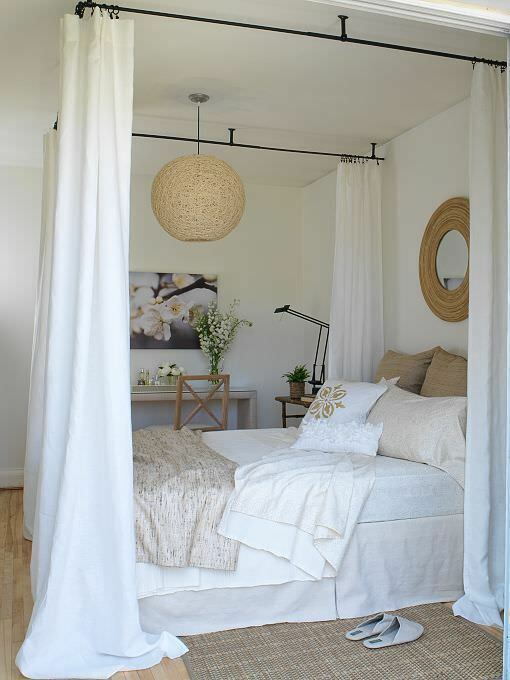 How many of these DIY canopy bed ideas do you wish you had? Share your canopy dreams with us in comments! And then jump on over to our posts on 16 DIY Headboard Ideas and Romantic Bedroom Makeovers! No idea where they got theirs, but many people create a ceiling frame using curtain rods… hope that helps!